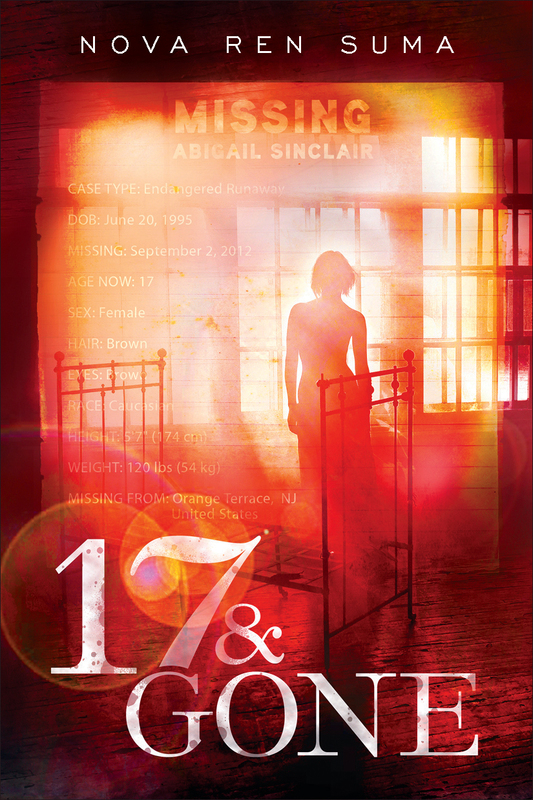 17 & GONE Cover and Plot Summary Revealed! Will you strangle me if I write one of those giddy, long-winded blog posts authors sometimes write saying I have a new book cover to show you and then it takes, oh, 17 paragraphs to get to the actual cover and you just end up scrolling down to see it anyway? Don’t strangle me. I have a new book cover to show you! I’m so thrilled to be able to tell you about my next YA novel coming out with Dutton on March 21, 2013. It’s called 17 & Gone—and the title and this Pinterest inspiration board are pretty much all I’ve told the world about it so far… until today. Now I’m excited to reveal it! 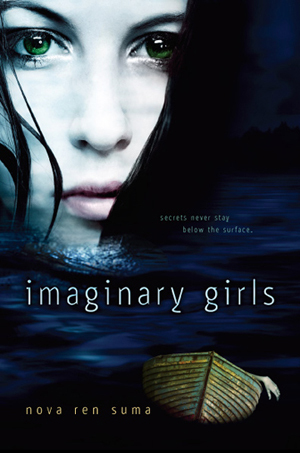 There is so much to this cover that strikes me and speaks to me about the book that I can hardly contain myself: the haunting figure of the girl, the fiery color scheme, the abandoned building, the distressed and water-stained type, and the ghosted “missing poster” and stats for a runaway named Abigail Sinclair… all of these things are significant. This is the book that has been haunting me, begging me to do it justice. And all throughout the madness and dark places I had to go to write this, I had this amazing editor to work with, Julie Strauss-Gabel, who has this way of seeing into me and knowing just what I am trying to say before I can fully articulate it into, you know, a working plot. Her powers as an editor are uncanny… supernatural even. I can’t imagine writing this book without her. What do you think of the cover for 17 & Gone? I hope it entices you to read the book! p.s. If you’re wildly excited to read 17 & Gone (coming out March 21, 2013, from Dutton!) you can pre-order it from your local indie or from Amazon (I’ll insert B&N and more indie links when they are active)—and you can add it to your shelf on Goodreads. Bloggers, reviewers, and librarians: I’m not sure when ARCs will be ready, but you are welcome to fill out this form to request an ARC of 17 & Gone here. I get excited when writers I know decide to try their hand at writing middle-grade fiction. I know a few who are just beginning their first middle-grade novels (tween? the label escapes me, so I tend to use it interchangeably depending on my mood), and I’m thrilled to have more writer friends to talk to about writing for this age group. For a while there it seemed like everyone was writing only YA. I’m glad that’s changing. 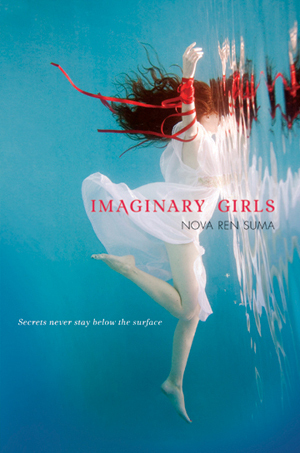 So, here I am deep into revising my own YA novel—Imaginary Girls will likely be for ages 14+, even if I decide to cut certain words, there is some serious content and darker themes in it. But that in no way means I’m done writing for tweens. I’d like to do both if the universe will let me. 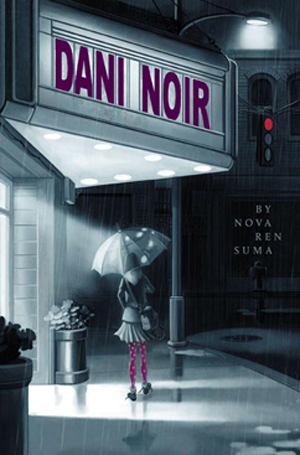 Dani Noir was my first real attempt, but I feel like it’s just a taste of the stories I’d like to explore. It was only me dipping my toe in. I want to write so much more. Why do I keep coming back to that age? When I was 16 and 17, those were life-changing years, yes, but the hardest year for me, the year where I really began to turn into the girl and woman I am today, was the year I was 12 and then turned 13, the year I was in the seventh grade. That was a very painful time for me personally, family-wise, socially, and more. But it’s so vivid—and I keep wanting to write it. The year I was 12 and would later turn 13, we’d moved from New Jersey to a house in what I was convinced was the absolute middle of nowhere in the Catskills. I lost a best friend, which felt devastating. 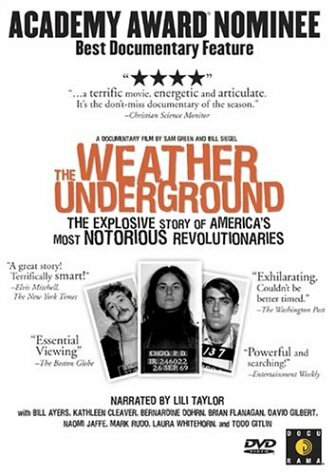 We moved in the summer into a rented house that was owned by two former members of the Weathermen—which ignited my imagination and shaped my forming view of politics, once I discovered the archives in the basement and the radical literature left behind on the bookshelves. I didn’t understand who they were, or how that house was involved in what’s now in history books, until much later. And while all this was churning around in my mind, I was also reaching that awkward time as a girl when you’re growing up and everyone around you is there witnessing it happen. That year, I was the new girl at school and ate lunch in the bathroom stall until I made friends, three of whom were named Heather, coincidentally, like the movie, and my sense of fashion included attaching safety pins in long rows up and down the legs of my clothes. I slept in a room off the kitchen that I was convinced was haunted, and I made friends for a brief time with a bad girl, smoked my first cigarette, which became my last cigarette after I confessed what I did to my mom, and cried over it out of terrible guilt. I had horrifying taste in music. I joined the pep squad and quit after our first practice in horror at having to “cheer” at teams involved with throwing balls. I wrote my first poems. I was painfully shy and unable to speak in class. I fought horribly with my stepfather and then made up with him happily and it was very confusing. I got a Ouija board. 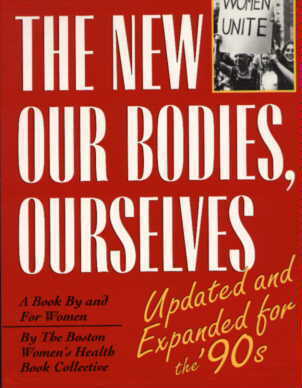 My mom got me Our Bodies, Ourselves. I studied ballet and wished to go on pointe. I made a friend, Erin, who was also a writer and who is still my friend today. 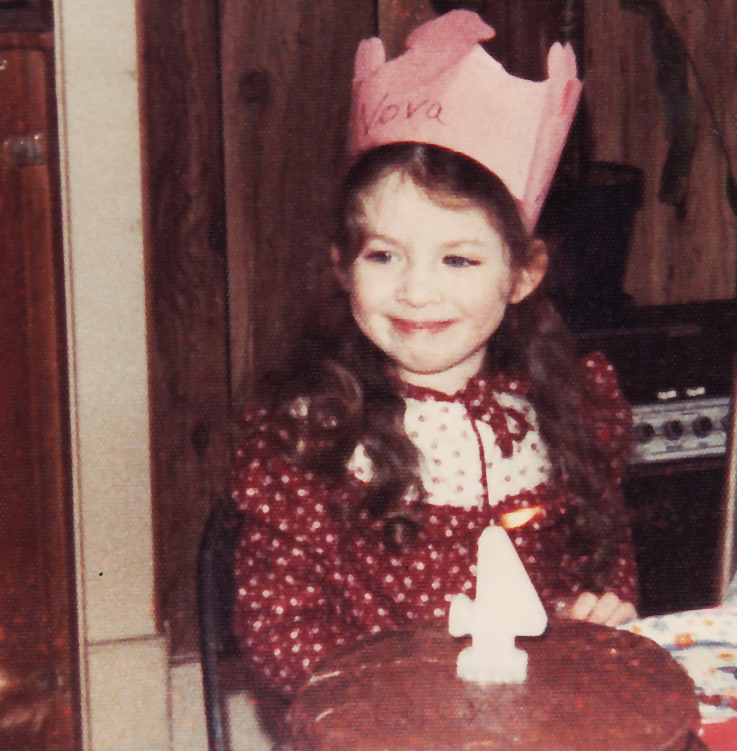 I hated my name and longed to have a name like Jen. I babysat my little sister and pretended she was mine. I had a crushing crush on a skater boy whose name started with E. I was so angry about things going on in my life but was unable to articulate them. I thought I’d never grow up. I thought I’d never get away. So I wished to be a writer. I decided that’s what I’d become, one day. I’d write books and I’d live in the city and I’d have a cute boyfriend who actually liked me back and I wouldn’t do dishes for the rest of my life. Not all of these things came true—I did dishes last night. But I am mostly who I wanted to be, aren’t I? I’ve already started a new middle-grade/tween book, but I just this weekend got an idea for a whole other one. I guess I’ll be perpetually 12 going on 13 for a while still… but today, while I revise, I’m back to 16. Is there an age in the past that feels especially alive to you, or are you all grown up and like to stay that way? If you’re interested in writing middle-grade fiction, do check out the new middle-grade blog From the Mixed-Up Files… of Middle-Grade Authors. Are you perpetually 12 going on 13, too? There was something I found comforting when I was feeling intimidated at Yaddo and, for that matter, the Writers Room where I go to write now that I’m home again: Every day, no matter who you are and how many brilliant books you’ve given the world, you and I, we both begin at the same place. We all—every single one of us, even those with Printzes and Pulitzers—have to start at a blank page. Knowing that helped me confront my own blank pages. It’s not easy. It’s not easy for any of us. And why should it be? So I’m returning to that wisdom now when I’m sifting through all the pages I have and working to make them better. It’s comforting for me to think how even the best writers don’t have their stories come out perfect at the get-go. Their words are revised. They, too, need to rethink. They need to readdress. They very well may need to take notes and notes and notes of ideas for ways to make their novel better, like I’m doing now. It is possible that they, too, wander the aisles of their local supermarket questioning their successes and their abilities and when they see a lumpy, scarred orange roll on the floor under the vegetable stand, they feel a deep connection to that orange because it may look dirty and messed-up on the outside, but maybe it tastes good on the inside. Maybe it’s better than you think. Maybe no one in the entire supermarket knows how good it could be (if it went home, and sat at its desk, and tried harder). Um, yeah. And I don’t even like oranges. Or maybe real authors don’t wander supermarket aisles questioning their worth. Maybe there’s a pillowy cloud in the sky where the successful, searingly brilliant writers go to celebrate their success and searing brilliance. They have pomegranate cocktails up there, don’t they? Maybe when they write up on their comfy clouds, plot flows out perfectly formed from their fountain pens. Their stories move at great speed and show no cracks. They learned how to write a good book a long time ago and now it’s way too easy so they play table tennis all day instead. Maybe if we look up into the clouds, we can see their toes dangling as they lounge about, taking their writing naps. I say—to myself, not to you, unless you feel like listening—let’s not bother with looking at everyone else. So I’m up on my low-flying cloud (fine—I’m sitting in a squeaky chair), sipping water because I don’t see any pomegranate cocktail, thinking of ways to make my novel better. Now, if only there were someplace to take a break and play some table tennis… I’m terrible at it, but guess what? I still try. And, sometimes, I surprise myself and I’m better than I think. 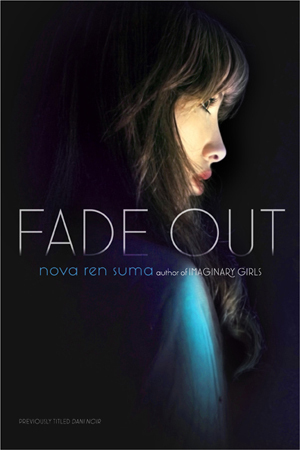 I’m in a bit of a reprieve until 2011, when this new novel I’m so freaking excited about is due to come out. I feel like I went through some great publicity hazing experiences, so I’ll be even better next time. I had my first group book signing at Books of Wonder. I had my first solo signing. I did my first radio interview. I did my first Barnes & Noble reading. I did blog interviews and answered letters from readers. I got my picture taken. I survived my first Kirkus review. I got my first royalty statement. I saw my Amazon ranking. I saw my book in stores and in my own branch of the public library. I laughed, I cried, and now I feel like I know what to expect next time. My skin has gotten thicker from all of it, and I’m grateful. I learn by doing, and I grow from every experience I have, as a person, as an author, and most significantly: as a writer. I’m in a pocket of quiet. And, right now, I need this little pocket. No book festivals. No events. No Google Alerts. No obligations. I need to do that thing that started all of this, the reason I’m in this in the first place: write. All so I can be better next time. But it’s funny how the writing becomes somehow tainted from the experience of having to promote myself in the past. I’ve started a new novel—YAY!—and I am poised to work on a very exciting project while I’m away next month—YOW!—and in the past my way of starting something new was to write silently to myself in my cave for months on end and only poke my head out after I’ve rewritten myself in circles enough to see I’m ready to give it air. Now, staring at my first pages, I’m already thinking: Will he like it? Will she like it? Will they like it enough to want it? Is it good enough / distinct enough / interesting enough? Does it have a big enough hook? Does it fit a trend? If it does, do I want it to? Will it stand on its own? Hello, will it SELL? And if it does, will it keep this name or get named something else? What will the publisher call it? What’s its label? What’s its genre? Where’s its spot on the shelf? What will reviewers say about this? What will readers say about that? Will anyone want to read it at all? In the face of trying to address all those questions, you can find yourself not writing anything. So I’m wringing out my mind. Letting those concerns wash out of me, swirl down the drain, rinse after rinse after rinse, till I’m clean. Out go the what-ifs and will-she-likes. Out go the panic of future submissions. The stars and no stars. The yeses and the nos. Out they go; I’ll gather them back up later. But for now—for the rest of this month, and for next month—I’m just going to be a writer. The kind who puts words down on the page and doesn’t let them see daylight till later. It feels like I’m back to that point before I was published. 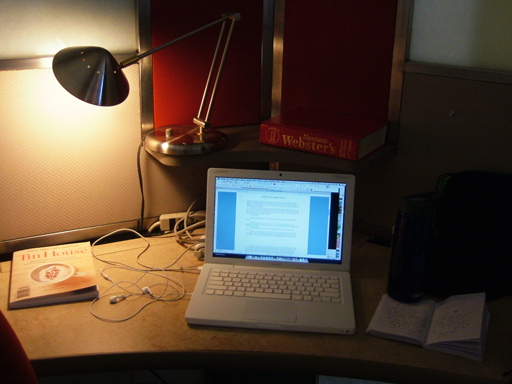 Where it starts and where it ends: with the writing. Every single one of us—no matter where we are in our careers or our dark caves—can be found here at one point or another. Writing page 16 or page 216 or page 1. I’ll be hanging here for a while. 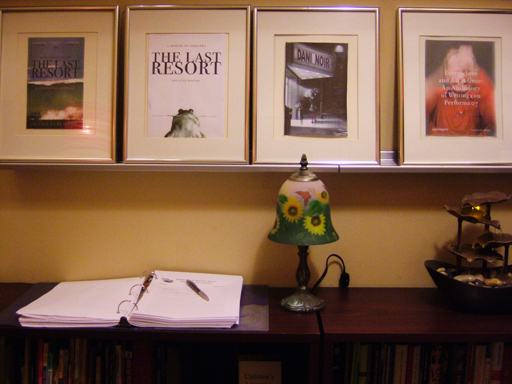 The foyer of my writing space, quiet on a weekend morning. I write in a place I can’t really call mine. I can’t leave my things out all over the desk. I can’t decorate the walls. I have to put my writing slippers and writing sweater away in my locker every single night. There’s a good chance that I’ll arrive in the morning to find someone else in my favorite chair. But I write here all the same—I can’t imagine being a writer in Manhattan without having this place where I can go 24 hours a day, any day, any moment. I carry the key with me everywhere. 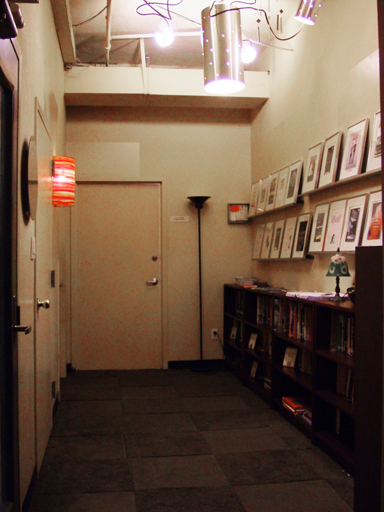 The place is called the Writers Room—and it fits its name: It’s a giant loft often filled with writers writing. Sure, we also check our Facebook and nap under our desks (guilty of this just last week), and we can be found chatting in the kitchen, or gathering up a handful of sugary sustenance from the constantly replenished M&M dispenser, or stretching in the typing room, but most often we’re at our desks. On a weekday, the place is packed. You hear pages turning, sometimes sneezing, doors swishing open and closed, chair backs adjusting, coffee slurping, and typing, from all directions and every corner, the sounds of tapping keyboards. The rhythm of other writers typing out their novels and stories and articles and plays and screenplays and poems makes me all the more motivated to type out mine. I love that sound. The sign-in sheet, and just above the little lamp... that's my book cover! I was giddily surprised one morning while signing in to look up and see it there. I’ve been a member here since I was a graduate student uptown. I had part-time morning and weekend membership then—I spent years on the waiting list to get full-time 24-hour-a-day access, and I’m so grateful to have it now. Back then, in the beginning, the Room was located somewhere else, in another building around the corner from where it is now. I’d get up at five in the morning and take the subway to Times Square, then transfer to another line, and get here, sometimes as the first person of the day. I’d leave in time for class or by eleven thirty; the latest I could stay as a part-time member. One of my favorite desks. Look how I made a mess already, and I haven't even started writing yet! Then the space moved, to a more wide open loft with giant windows overlooking Broadway, and there were a few weeks of adjustment, but I easily found my new favorite desks and settled into my routines. I got full-time membership years ago, but I couldn’t make use of it with my day job. Still, I held on. There were days when I’d come in when it was still dark on a Saturday morning, flattened from a stressful workweek at my job, feeling like a robot, someone barely worthy of calling herself a writer… but then I’d sit at my desk, and I’d switch on my light, and I’d open my word processor, and I’d start tapping away into the silent space like the other writers who came here, and I felt worthy somehow. I felt right. I still feel that now. I need this separation from home. I need a creative-only space. This place is not for everyone, and that’s fine by me. We’d be too crowded otherwise. I’ve written thousands of pages here, in its previous location and now the new one, no exaggeration. Stories and my graduate thesis and work-for-hire manuscripts and novels published and soon-to-be-published and never-to-be-seen. I like the quiet of the Room—no talking at the desks. I like the cell phones banished to the phone room. I really don’t mind that no one can reach me by phone while I’m here (fyi: try e-mail). I like the sounds of all the other writers working around me. I like looking out the windows at the city lights at night. I can’t bring friends up since it’s members-only, but I show them from down in the street. I’ll point up to the row of top-floor windows—always lit up, whatever the day, late into the night. “That’s where I write,” I say. Looking up at it from the sidewalks down below, there’s a privacy and also a magic. Each desk is a blank slate, a blank page. Anything could happen here. Anything has. 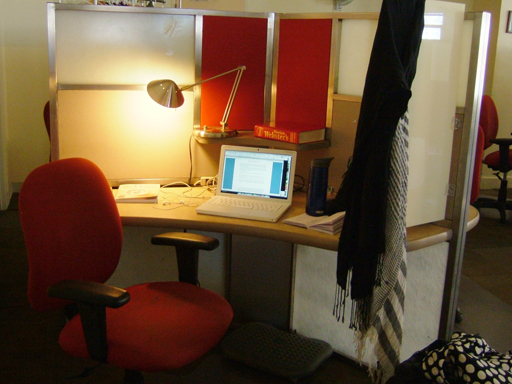 My favorite desk; it was here waiting for me this morning. I come here in pajamas sometimes. I don’t wear makeup; my hair’s a mess. I’m really not here to network. I write often with a scarf over my head, in semblance of a tent. I walk the halls in a daze, deep into whatever I’m writing, so I’m not so talkative and I hope no one takes it personally. There are times when I walk past a great writer whose books I’ve read and admire to no end and I think, How can we both write at the same desks? How is that POSSIBLE? But it is, somehow. There are all kinds of writers here. Ones like me, and geniuses like them. This place is open to all of us. I didn’t photograph the rest of the space—you’ll have to imagine. It’s a private place, and writers are right now writing all around me, and I didn’t want to bother anyone. About to sit down and write... if that issue of Tin House magazine doesn't distract me first. E renewed my subscription for my birthday! I come here almost every day, even if I only really have time to write for a half hour. Maybe one day, when I can afford a bigger place to live, and we leave this city for somewhere else, I’ll have a writing office at home. What a luxury that would be. 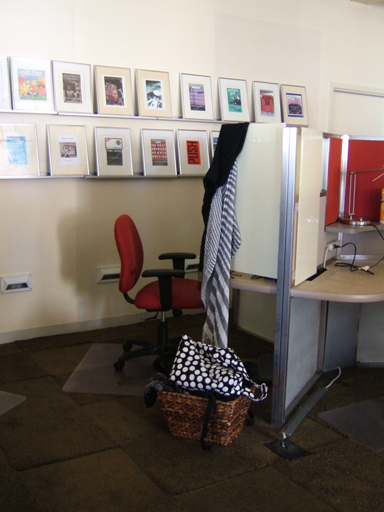 For now, I have the Writers Room, my most favorite place to write in this entire city. I was here yesterday. I’ll be here tomorrow. I am here right now. This is the main place where I write. The other is a café. Where do you write? I’m older today. That’s right, the dreaded birthday has arrived. I was recently at a tax appointment with my first grown-up accountant (not that I used children to do my taxes before, only that this is the first time I am being a grown-up and using a pro accountant to do my taxes) and as she plugged in our info, she noticed that our birthdays were approaching. E’s was Sunday, and mine is today. We’re the same age, and we’ve been together since we were technically teenagers, so sometimes it’s like watching your childhood disintegrate before your eyes. I remember him when he was young. I remember being young with him. Sometimes I look in the mirror and am shocked that we’re not who we were when we first fell for each other and became inseparable. It’s quite strange. Unfortunately, E drank some magical potion when he was younger or something because he barely shows his age. Me, I’ve been dyeing my hair since I was 22. I blame stress. Anyway, our accountant said happily that it was almost our birthdays and we groaned involuntarily, couldn’t help it. This wasn’t the best of reactions, because though we may feel old—and maybe there are things we wanted untangled in our lives that are still in tangles and we really hoped we’d have it all figured out by now—we are not as old as we could be, and we have each other, and, as our accountant pointed out, we are alive. And every year you are still alive is a great thing. Many people don’t make it this far. Hearing that when you are groaning about your upcoming birthday puts things into perspective, for sure. Maybe I am not where I thought I’d be at this age, but I’ve stopped running the race only I was in. My life unfolded, is unfolding, at a pace I can’t control, but every year I get closer to the dreams I’ve held since I was a kid… dreams that I confessed to E when we first met and fell in love, in fact. I’ve wanted to be a writer as long as he’s known me—longer. So, here I am, one year older. The book I think of as my true debut—my real self on those pages—won’t be out for a year and a half, so I’ll be even older then. And you know what? The number just can’t matter. It can’t. I want to stop counting. For those who wonder if they will ever reach the goals and dreams they long for, who measure their accomplishments in years and think they failed if the arbitrary year marker passed them by, I want to show you how much things can change. Wait. That’s not for you—it’s for me. I want to remind myself how much things have changed. That’s how much your life can change in four years. So I’m older today, fine. But I’m here together alive with E—and though HE DOESN’T AGE, I SWEAR IT’S CRAZY HOW YOUNG HE LOOKS, we’ll be fine. Happy one more year to me.